Psychopathy is characterised by emotional disturbances that affect interpersonal behaviour and decision-making. The objective of this paper is to review the most recent contributions to the field of neuroscience of psychopathy and the implications that this disorder has on the criminal legal field. In regards to this last aspect, we evaluate the issue of psychopaths’ accountability and the incidence of psychopathy in many other penal institutions. In terms of the contributions of neuroscience, we will focus on the orbitofrontal (ofPFC) and ventromedial (vmPFC) regions of the frontal lobes and on the amygdala. Data spanning from the nineteenth century to the present indicate that damage to the ofPFC and vmPFC is the basis of behaviours that have been referred to as pseudopsychopathic. The earlier during brain development the damage occurs, the more likely these behaviours will resemble those of psychopaths. The damage to the amygdala is rather related to impairments in the ability to distinguish facial expressions of fear and the capacity to feel emotions. Damage to ofPFC, vmPFC, and amygdala are highly relevant to the expression of pseudopsychopathic behaviours. La psicopatía se caracteriza por alteraciones emocionales que afectan a la conducta interpersonal y la toma de decisiones. El objetivo de este artículo es revisar las contribuciones más recientes al campo de la neurociencia de la psicopatía y las implicaciones que tiene este desorden en el ámbito legal criminal. En relación a este último aspecto, analizamos la cuestión de la responsabilidad de los psicópatas y la incidencia de la psicopatía en muchas otras instituciones penales. En relación a las contribuciones de la neurociencia, nos centraremos en las contribuciones de las regiones orbitofrontal (CPFof) y ventromedial (CPFvm) de los lóbulos frontales y en la amígdala. Los datos que cubren desde el siglo XIX a la actualidad indican que el daño a la CPFof y la CPFvm se encuentra en la base de las conductas que han sido denominadas pseudopsicopáticas. Cuanto más temprano ocurra el daño en el cerebro más probable es que estas conductas se parezcan a las de los psicópatas. El daño a la amígdala está más bien relacionado con alteraciones en la capacidad de distinguir las expresiones faciales de miedo y con la capacidad de sentir emociones. El daño a la CPFof, la CPFvm y la amígdala es muy relevante para la expresión de las conductas pseudopsicopáticas. Psychopathy is a construct characterised by personality facets such as selfishness and emotional poverty (lack of guilt or remorse and empathy) along with behavioural aspects, such as poor behavioural control, impulsiveness, and lack of responsibility (Cleckley, 1976; Glenn & Raine, 2014). Among the features that distinguish psychopaths are their superficial charm, lack of remorse or shame, untrustworthiness, self-centeredness, inability to love, failure to learn from experience, emotional poverty, lack of empathy, poor planning abilities, and antisocial behaviour. Using the Psychopathy Checklist-Revised (PCL-R), developed by Robert Hare, the 20 psychopathic characteristics proposed in the PCL-R have been grouped into two factors: factor 1, interpersonal-affective, and factor 2, antisocial lifestyle (Hare, Newmann, & Widiger, 2012). The relevance of this construct is revealed when incidence data are presented. Accordingly, there is consensus that up to 1% of the general population meets criteria for psychopathy, and this percentage rises to estimates ranging from 15% to 25% within the prison population (Muñoz Vicente, 2011; Reidy et al., 2015; Torrubia & Cuquerella, 2008). The studies carried out with psychopathic subjects have also shown interest in decision-making, given their poor behavioural control, impulsivity, and antisocial behaviour. Such altered decision-making has been studied in laboratory conditions using the “passive avoidance learning paradigm”, in which subjects must avoid response options that lead to punishment (Koenigs & Newman, 2013). This stimulus-punishment learning is the basis of a proper socialization that helps children and youth prevent harm to others (Blair, 2013a). In the same vein, there are the results of a recent 10-year longitudinal study that included 102 participants with an average age of 7.8 years at baseline and 17.4 years when the study concluded. Children with high levels of psychopathy showed worse emotional regulation skills in adolescence (Romero, Kapralos, & Gomez-Fraguela, 2016). Thus, the goal of this paper is to review different neuroscientific and legal aspects to improve the response to the challenges that the people who have high scores in psychopathy produce in our formal control system. We consider that this challenge cannot be solved from a purely scientific or legal approach. On the contrary, in such a response science and law must be combined in a dialogue that this work aims to help establish. Psychopathy has been object of intense debate within the legal field, both in terms of the legal consequences for individuals with this condition and the implementation of adequate legal regulations. The challenges this personality disorder poses to criminal law begin with the question of whether individuals with psychopathy can be held criminally responsible. However, this is not the only issue to be considered. The strong links between psychopathy and criminal dangerousness (at least, but not only, in the popular perception) strengthen the impact, as we shall see, this disorder has in many legal-criminal institutions. There are many instances in which the Spanish criminal law, more or less explicitly, allows or requires that the offender's personality and willingness to engage in new criminal behaviour is taken into account. Without being exhaustive, this is the case in the current Spanish Criminal Code of the aggravating circumstance of recidivism (art. 22.8a) and its qualified form (art. 66.5a), with “the danger posed by the offender” to complement the principal punishment in certain crimes with certain accessory penalties (arts. 48 and 57), with the possibility of attending to the “personal circumstances of the offender” in the final determination of the sentence (art. 66.7a), with reference to the “individualised prognosis and favourable social reintegration” and “the personality of the convicted offender” to make certain decisions concerning the access to the third prison grade (art. 36) or probation (art. 90 and 92); and also the obligation for the judge or court to attend to the need for the execution of the sentence “to avoid the future commission of new crimes by the convicted person” as limit of the suspension of the execution of imprisonment (art. 80). The increasing importance attached to the prediction of future behaviour in relation to the duration and specific circumstances of the execution of the sentence can lead to well-founded fears about the possible consequences of labelling the offender as a psychopath, because, after all, psychopathy is probably one of the offender's characteristics most negatively appraised by the legal system, constituting in practice an “aggravating circumstance” of criminal responsibility (Fox, Kvaran, & Fontaine, 2013). Such severity in the criminal treatment of those who once labelled psychopaths supposedly represent a greater danger to society is often reflected in tougher penalties, not necessarily only in terms of their duration, but also in the intensity of their execution. Paradoxically, the strict criminal treatment of individuals with psychopathy or other severe personality disorders does not recede when they are declared totally or partially not responsible. In these cases, the concurrence of a prognosis of recidivism (criminal dangerousness) does not simply result in the exemption or reduction of a sentence, which would be expected in other circumstances, but in the imposition of security measures that can also lead to the deprivation of freedom for a period of time that could reach the same duration of imprisonment had the subject been fully responsible; individuals may be confined to hospital settings, rather than to prison (interment in a psychiatric institution, arts. 6, 95 et seq. and 101 et seq. Penal Code, hereinafter: PC). In theory, the imposition of security measures does not pose problems concerning criminally responsible or partially-responsible subjects, because the system recognises the absence of any cognitive or volitional impairments that should be taken into account. It is however controversial to impose security measures (in addition to sentences) on subjects declared fully responsible. In the case in particular of subjects affected by psychopathy, if we acknowledge that there is no effective treatment available – as it is usually said, the imposition of a security measure in addition to a sentence is questionable, because it would have no other objective than the prevention of injury interests of third parties or society as a whole. It is significant that even in the Anglo-American legal system, generally very willing to justify incapacitation (subtype of “desert-based detention”, through the extension of the length of the sentence and the aggravation of recidivism), serious doubts are raised in terms of establishing a “disease-based detention”, because it would considered incompatible with the precepts of the traditional “involuntary civil commitments” and “insanity acquittals followed by commitments”, and only imaginable as an extension of “commitment for mentally abnormal sexually violent predators” established in the legislation of several American States (Morse, 2013). The expansion of security measures to imputable subjects constitutes an incontestable fact in Spanish law, and its most obvious example is the security measure of supervised release, introduced in 2010 (its scope was expanded in the reform of the criminal code in 2015). However, a sound resistance to such recent political-criminal tendency is observed in a broad range of specialists who have dealt with it. Among others, Maraver Gómez (2015) and Rodríguez Horcajo (2014) have expressed their opposition from different perspectives. The reason for this criticism is not only found in the unreliability of prognosis of dangerousness, but also in the contradiction that may involve qualifying the same subject as responsible and dangerous, given the normative definition of a responsible subject as “someone from whom the order expects and demands conformance to the law” (Peñaranda Ramos, 2015). Determining whether it is possible to treat a mental disorder and, if applicable, how this may be done in a technically feasible way is strictly a matter of scientific inquiry. Law has nothing to say about this matter. But it is necessary to clearly distinguish the legitimacy of such eventual treatment. Given the characteristics of psychopathy, it has been traditionally believed that psychopaths are not susceptible to be subjected to an effective treatment that prevents their willingness to engage in socially harmful behaviours. Some studies have even suggested that applied treatment programs, following for example the method of therapeutic communities, could be counterproductive (Schug & Fradella, 2015). However, recent reviews of studies on which such pessimistic views are based have shown the severe limitations exhibited by the evaluated treatment programs. Skeem, Polaschek, Patrick, and Lilienfeld (2011) note that the only study that seems to confirm that treatment may increase the rates of recidivism of psychopathic offenders refers to a therapeutic community developed in a Canadian prison forensic hospital of maximum security in the 1960s, under conditions that hindered its potential effectiveness and would be considered completely unacceptable today. The consideration of principle recently exposed by Maibom (2014) results extremely interesting when considering the effectiveness, legitimacy, and legality of treatment. This author points out the particularly problematic nature, from all these perspectives, presented by treatments that, because of involving the modification of personality traits closely connected to each other and with the whole moral disposition of the individual (with its own Weltanschauung), could only be legitimately and effectively implemented with the collaboration of the individual. The possibility to admit or exclude the criminal responsibility of psychopaths does not depend solely on the data provided by modern research in neuroscience, but also on the understanding gathered in the field of Philosophy and Law – and particularly in Criminal Law – about the corresponding notion of responsibility and the particular precepts that support it. However, it should be noted that such understanding is changing, partly because of the influence of recent scientific research about mental processes on criminal-legal and philosophical studies. The article 20.1a of the Spanish Penal Code regulates the cause of exemption from criminal accountability known as “defense of anomaly or psychic alteration”. In short, this cause excludes the responsibility of anyone who, at the time of the offense, “cannot comprehend the unlawful nature of the act, or act in line with that comprehension” because of “any mental anomaly or alteration”. This exonerating circumstance requires, therefore, that the existence of a disorder and its impact on the offense it accredited. This normative solution is known as “mixed formula”, as opposed to the “biological formula”, for which it is sufficient to offer proof of the disorder, and to the “psychological formula”, for which it is sufficient to prove the reduced capacity at the time of the offense without specifying the cause (Díaz-Maroto Villarejo, 1988; Jorge Barreiro, 2000). Psychopathy can be easily comprised by the broad concept of “mental disorder” included in the normative. What is more uncertain, even within the scientific community itself, is whether the effects of this “anomaly” truly incapacitate the subject in question to “comprehend the unlawful nature of the act, or act in line with that comprehension”. This is an aspect leading to great debate both within the courts and among academics. The position of the Spanish Supreme Court suffers from a certain degree of conceptual misunderstanding when terms such as “psychopathy”, “antisocial personality disorder”, “antisocial borderline personality”, and “borderline personality disorder” are indistinctly used to refer to psychopaths. This makes it difficult to appreciate a precise criterion in its performance. However, with some notable exception, the Spanish Supreme Court maintains that psychopathy does not exempt individuals from their responsibility, especially if this is the only anomaly presented. The Sentence of Spanish Supreme Court (hereinafter, STS) 10-07-2008 is highly illustrative in this regard, when declaring that psychopaths are “able to understand the wrongfulness of certain behaviours and to conform to moral and social norms, acting in accordance with that understanding, and that it is not sufficient to show an aggressive and violent nature as a personality trait to reduce responsibility”. However, in several sentences it has been admitted that the responsibility of psychopaths is, to a greater or lesser extent, somewhat reduced, particularly when the subject presents any other condition in addition to psychopathy (for example, the STS 18-01-2012). This relative homogeneity seen in jurisprudence is not observed however in the literature. Important authors, like Morse (2008) or Roxin (2006) and, in Spain, Cancio Meliá (2013) or Martínez Garay (2005), believe that those who suffer from psychopathy – at least in particularly severe cases – lack, in light of the latest scientific findings, the minimum necessary conditions for them to be attributed full criminal responsibility, or even rule out that psychopaths (or at least some of them) have the necessary degree of rationality to be held criminally responsible for their actions. The basis of this point of view differs across authors. According to some, such investigations have revealed that psychopaths lack the necessary evaluative standards to assess and responsibly guide their behaviour (Litton, 2008), or even sensitivity to take into account purely prudential reasons against a criminal course of action (Finlay, 2011). Others claim that psychopaths are capable of knowing the facts, the social and legal rules, and instrumentally pursuing their own interests, but reject they can be guided by moral reasoning, which would be a necessary component to fairly attribute to them a sentence genuinely deserved because of their “[blindness] to moral concerns” (Morse, 2008). Similarly, based on a stratified three-level distinction of moral responsibility – “attributability”, “answerability”, and “accountability”, Shoemaker (2015) notes it is quite difficult to accept the responsibility of primary psychopaths in this third level and, although more hesitantly, also in the second, because of their lack of “emotional empathy”, that is, the ability to feel what others feel and emotionally commit to them on the basis of such feelings, and other skills merely instrumental in nature, respectively. In the same vein, it has also been suggested that the significant differences observed between “psychopaths” and “normal individuals” are so extreme that it is expected that the former will be considered criminally not responsible in the future. This is because psychopaths lack the basic and elemental level of empathy to be defined as “normal” (Cancio Meliá, 2013). However, the idea expressed by this last author, that such exclusion or reduction of criminal responsibility would also be normatively acceptable because the cases to be processed would be few and well-defined, is incongruent with the dimensional character, gradual and not categorical, of psychopathy, at least according to the measurement methods used so far for its diagnosis. Moreover, something that does not seem to fit with this idea is the fact that psychopaths do not stray much from the image of a normal person in normal circumstances as to declare them not responsible. As noted by Pilsbury (2013), the selfish rationality of psychopaths (me-now) is not incomprehensible to the whole society. For these or similar reasons, the determined and committed stance of that first group of authors does not express the most widespread view at the moment in the field of legal philosophy and criminal law. Many argue, in fact, that those investigations do not show that people suffering from psychopathy completely lack the skills required to have a sufficiently profound moral knowledge of their actions. Still, not a few authors warn that criminal legal responsibility does not necessarily depend on whether the subject is also specifically receptive to moral reasons (Maibom, 2008; Talbert, 2008). In any case, there is currently a strong consensus that the consideration of individuals suffering from certain psychological disorders, in particular psychopathy and antisocial personality disorder, as criminally responsible or not responsible (unimputable) of their actions, is just a normative matter, which must be ultimately decided using specific criminal-legal criteria, and not simply by including those individuals in psychological or psychiatric categories (Feijoo Sánchez, 2011; Pérez Manzano, 2011), because “not everything that explains behaviour is reason enough for its excuse” (Martínez Garay, 2005). Advances in neuroscience are undoubtedly improving the available knowledge about the explanation of human behaviour, but the reasons to excuse or not a certain behaviour depend on what society is reasonably willing to assume, and not on the nature of things. However, there is also an increasingly widespread consensus, in which the authors just cited take part, that legal assessment is not immune to the results of scientific research concerning the etiology of such disorders, their effects on the several capacities involved in guiding the individual's behaviour according to the demands of the legal and social order, and the treatment possibilities that can be offered to those who may need them. A more precise knowledge about all these aspects will also have an impact on the limits of responsibility and implementation of criminal penalties. Therefore, a dialogue between the sciences that empirically study these disorders and the legal and philosophical doctrines regarding criminal responsibility is necessary. Contributing to such dialogue is precisely one of the main objectives of this article. In psychopathy, associated to the field of criminal justice, it is common to refer to primary and secondary psychopaths; in the case of the former, instrumental aggression is predominant, while affective aggression predominates in the case of the latter. For a recent review on the neurobiological basis of aggression and violence see Ortega-Escobar and Alcázar-Córcoles (2016). The study of the neurobiological basis of psychopathy is important in view of possible clinical approaches that assist the justice system with both prevention and intervention, as well as with the response to criminal acts carried out by individuals with high levels of psychopathy (Koenigs & Newman, 2013). Especially, a social response as radical as prison needs a sound scientific basis. Data on brain damage can inform us about the regions most likely to be involved in manifestations similar to those found in psychopathy and, therefore, can allow us to analyze them in more detail using structural and functional neuroimaging techniques. This approach is defended by Yang and Raine (2006) when they write “Neurological research on individuals who were once normal but who then suffered brain lesions allows temporal cause-effect relationships to be teased out” (p. 285). The brain regions that have been consistently associated in the literature with psychopathy are the ofPFC, vmPFC, ACC, striatum, insula, temporal lobe, and amygdala (Blair, 2013b; Glenn & Raine, 2014), some of which are considered part of a network called the temporal-amygdala-orbitofrontal network (Catani, Dell’Acqua, & Thiebaut de Schotten, 2013). Neuropsychology, by studying subjects with damage in specific brain regions, can compare their behaviour and personality with the behaviour and personality of psychopaths and help to locate the approximate areas of brain dysfunction associated with psychopathy. This can be done using a number of tasks that are sensitive to damage to the ofPFC and vmPFC, although they must be modified for them to be sensitive enough and used in conjunction with observations of everyday life (Zald & Andreotti, 2010). Damage to the orbital surface of the frontal lobes leads to a syndrome known as pseudopsychopathy (Blumer & Benson, 1975). Pseudopsychopathic behaviours emerge following damage to the ofPFC or the tracks that go across this region. One of the first case studies that related psychopathy-like behaviours with prefrontal cortex damage was described in 1888 by Leonore Welt (Benton, 1991); this subject fell from a fourth floor and suffered a penetrating frontal fracture when he was 37 years old. After a speedy recovery, a complete change in character was observed: from being an honest, hardworking, nice, and skilful person at work, he became aggressive, malicious, and driven to play unpleasant pranks. This change lasted about a month and he then began to improve and behave as he had always been, aware of his behaviour and repenting of it. After his death, the autopsy showed the destruction of the gyrus rectus in both hemispheres, as well as in the medial ofPFC and right vmPFC. Welt also examined another eight cases of subjects that showed personality changes, and autopsies always revealed that the ofPFC was involved (Benton, 1991). The patient EVR (Eslinger & Damasio, 1985) received surgery due to a meningioma in the ofPFC. Following the surgery, the subject showed damage to the vmPFC and ofPFC of both hemispheres. After his recovery, EVR took risks in his economic investments and went bankrupt; he received complaints from his employees, who said he was very disorganized despite showing appropriate manners and temperament. He had family difficulties that led to his divorce. Neuropsychological tests showed that his intelligence and memory were normal. However, he took a long time to complete tasks of everyday life because he showed difficulties in decision-making. In the neuropsychological study, EVR had little difficulty with tests designed to detect frontal lobe dysfunctions. It is worth noting (Eslinger & Damasio, 1985) that this patient showed a very significant dissociation between normal performance in neuropsychological tests and abnormal behaviour in real life. Bechara, Damasio, and Damasio (2000) have extensively studied patients with damage to the vmPFC. In decision-making tasks, subjects without brain damage to the vmPFC, or with damage in other areas, make a greater number of beneficial decisions, while subjects with brain damage to the vmPFC persist in making inadequate decisions. In a study with subjects with damage inside and outside the PFC, Gläscher et al. (2012) showed that a decision-making test was the only one associated with lesions in the ventral areas of the left medial PFC, dorsal areas of the right anterior PFC, ACC, and frontal lobe. Hornak et al. (2003) studied patients whose lesions in the PFC were categorized as orbital, medial, and dorsolateral. Using tests of vocal emotion and facial expressions as well as questionnaires assessing their emotional subjective experience in their daily lives since they had undergone surgery, the most significant alterations were associated with the ofPFC. For Szczepanski and Knight (2014), individuals with damage to the ofPFC show deficits in inhibition that have occasionally been characterised as impulsivity even though they have been better characterised as risky behaviour (Alcázar-Córcoles, Verdejo-García, Bouso-Saiz, & Ortega-Escobar, 2015). Deficits in inhibition represent one of the critical points concerning psychopathy and Criminal Law. As we have seen, the Spanish Penal Code recognizes a legal defense when the offender “cannot comprehend the unlawful nature of the act, or act in line with that comprehension”. However, not any deficit can lead to a reduction in punishment. It needs a certain intensity (and it is, again, a legal question). It is noteworthy that it has been determined that deficits in the Iowa Gambling Task (IGT) were exclusive of patients with damage to the medial ofPFC and vmPFC, and to the frontal pole. These authors reviewed other studies examining patients with damage to the ofPFC who show a normal performance in the IGT. Therefore, these authors conclude that this test may not be ideal to assess the behavioural deficits specifically associated with damage to the ofPFC. There are also studies of adults who suffered brain damage in early childhood (Anderson, Bechara, Damasio, Tranel, & Damasio, 1999). One patient had a bilateral injury at 15 months of age that affected the ventromedial and polar prefrontal areas. A second patient had undergone the resection of a tumour in the right frontal hemisphere at three months of age, which involved both the medial and dorsal right polar areas. These patients were studied by the authors at 20 and 23 years of age, respectively. In the neuropsychological tests, they were unable to give appropriate responses to social situations or reason when faced with social dilemmas. Patients were not familiar with social rules, unlike individuals who have suffered damage in the ofPFC as adults; they showed lack of empathy or remorse. They also showed immature moral reasoning and a more intense antisocial behaviour than those who had suffered damage as adults; these subjects showed a behaviour similar to that of adult primary psychopaths. Eslinger, Flaherty-Craig, and Benton (2004) summarized 10 cases of early damage to the PFC. The authors suggest that there were differences between injuries to the dlPFC, mPFC, or orbito-polar PFC. The age of onset of the injury was also important. The cases that were most severely affected were those who had suffered damage to the frontal lobe region and/or ofPFC and inferior mPFC. The emotions of these individuals were superficial, unstable, and strongly influenced by immediate situations. As with psychopaths, these patients did not seem to be able to learn from experience. Another study conducted with eight patients with early-onset injury, before age 17, in the vmPFC was carried out by Taber-Thomas et al. (2014). According to the results, the subjects supported significantly more subjective judgments that were against moral rules or involved inflicting harm to others, and the probability of these last behaviours was greater the earlier during development the damage in such cortical region had occurred. These results could be mediated by distorted cognitive processes that promote action while neutralizing guilt, and thereby maintaining the aggressor's positive self-image (Roncero, Andreu, & Peña, 2016). However, the subjective assessment that someone makes of his previous conduct should not, as such, be considered in the field of Criminal Law. In this area it is enough that the offender is able to understand the “law's meaning”. A confluence between the offender's moral values and the values of law is not necessary. Criminal Law is not that ambitious. There are some studies with subjects that have suffered damage to the amygdala because of calcification, due to the Urbach-Wiese disease. These subjects do not learn fear conditioning (Bechara et al., 1995). In most cases, patients with bilateral lesions in the amygdala do not show social deficits that are clearly apparent. One explanation that has been offered for this is that in many cases it is unknown when the damage occurred during development, and it is possible they may have learned to behave in social situations. These patients are able to display normal emotional facial expressions, although they are not always able to correctly interpret the facial expressions of others (Phelps & LeDoux, 2005). The patient S. M. is unable to recognize facial expressions of fear, although she is able to recognize the identity of a face (Adolphs, Tranel, Damasio, & Damasio, 1994), and this is essentially because she is unable to spontaneously fix her gaze in the eyes of subjects expressing the facial emotions (Adolphs et al., 2005). When asked to look at the eyes of an image expressing the emotion of fear, then her performance is comparable to that of normal subjects (Adolphs et al., 2005). S. M. expresses highly emotional and traumatic vital experiences in a dispassionate manner; in addition, even though she showed interest in other people, her threshold for the pain of another person was described as “quite high” (Tranel, Gullickson, Koch, & Adolphs, 2006). In a later study (Feinstein, Adolphs, Damasio, & Tranel, 2011), S. M. was exposed to a series of emotion-inducing stimuli, primarily fear (snakes and live spiders, strolling through a haunted house, seeing horror films interspersed with others that were intended to induce disgust, sadness, anger, etc.). S. M. did not show fear responses to the animals, the haunted house, or the horror movies. The structural neuroimaging studies of the brains of psychopaths have shown decreases (↓) and increases (↑) in volume in the following brain structures: ↓ hippocampus, ↓ cingulate gyrus and frontal, superior, and middle frontal gyri, ↓ ofPFC, ↓ temporal lobe, ↓ basolateral, lateral, central, and cortical nuclei of the amygdala (Boccardi, 2013) and nucleus accumbens of the basal ganglia (Boccardi et al., 2013). Some studies have found significant associations between the amygdala's volume and psychopathic characters (Gregory et al., 2012), although there may be no difference in volume if some nuclei increase in volume and others decrease, as observed in several studies (Boccardi et al., 2011; Gopal et al., 2013; Yang, Raine, Narr, Colletti, & Toga, 2009; Yoder, Porges, & Decety, 2015). In terms of the differences in cortical structures between individuals with and without psychopathy, some studies report a reduction in the volume of gray matter (cerebral cortex) in the anterior mPFC and temporal pole (Gregory et al., 2012). Boccardi et al. (2011) and Ermer, Cope, Nyalakanti, Calhoun, and Kiehl (2012) observed decreases in the volume of gray matter of the ofPFC in their samples of psychopaths. A decrease in the volume of the ofPFC was also observed in a study in which unsuccessful psychopaths (who could not avoid criminal behaviour) were compared with successful psychopaths and control subjects (Yang, Raine, Colletti, Toga, & Narr, 2010); unsuccessful psychopaths had less volume in the ofPFC than the subjects in the other two groups. Other studies are reviewed in Umbach, Berryessa, and Raine (2015). The morphology of axon tracts connecting different brain regions has also been studied. Two studies (Craig et al., 2009; Motzkin, Newman, Kiehl, & Koenigs, 2011) found a reduced integrity in a tract, the uncinate fasciculus (UF), connecting the temporal lobe, where the amygdala is located, with the ofPFC (Thiebaut de Schotten, Dell’Acqua, Valabregue, & Catani, 2012). The reduction in the integrity of the UF was associated with the Facet 4 of Factor 2 (poor behavioural control, behavioural problems in childhood, juvenile offenses, etc.). A study by Sundram et al. (2012) also found a reduction in the volume of the UF and a negative correlation with the Factor 2 of psychopathy, that is, with antisocial behaviour. A study by Wolff et al. (2015) found a reduction in the volume of the right UF, but also found that this reduction was specifically related to the Facet 1 of Factor 1 (interpersonal characteristics of the psychopath -pathological lying, grandiose sense of self-worth, manipulation, superficial charm). Therefore, this reduction in the right UF observed in all studies to date could be a biological marker of a distinguishing feature of psychopathy, such as interpersonal features. Another study (Sethi et al., 2015) specifically examined the association of another fascicle, the dorsal portion of the fasciculus cingulate, connecting the PCC with the mPFC, with emotional indifference (Facet 2 of Factor 1: lack of remorse or guilt, superficial affect, lack of empathy, lack of responsibility for action). It has been proposed that the mechanism behind alterations in these two fascicles in psychopaths is the lack of maturation of the white matter (Sethi et al., 2015). There have also been studies of white matter anomalies in adolescents with behavioural disorders (Pape et al., 2015; Sarkar et al., 2013). These have a high risk of developing antisocial personality disorder and psychopathy. The study by Sarkar et al. (2013) examined the UF but, unlike that observed in adults, the structural integrity of the UF was greater than that of controls. The study by Pape et al. (2015) showed that the “grandiose-manipulative” and “callous-unemotional” characters from the Youth Psychopathic Traits Inventory correlate with a variable set of fascicles of white matter and not just with the UF. This study shows a positive relationship between the UF and the “grandiose-manipulative” character, but not with the “callous-unemotional” and “impulsive-irresponsible” characters. As in structural MRI, we begin by examining data about the amygdala. Kiehl et al. (2001) conducted the first study showing dysfunction of the amygdala, using a comparison task of emotional and non-emotional words in a sample of eight offender psychopaths, eight non-offender psychopaths, and eight non-criminal controls. The psychopaths showed a smaller difference between the functional responses to the two types of words in the amygdala, hippocampal formation, parahippocampal gyrus, nucleus accumbens, ACC and PCC. Research using fMRI has been conducted to evaluate changes in the amygdala associated with moral judgments, processing of facial expressions, emotional memory, processing of abstract and concrete words, and theory of mind (Blair, 2013b). For example, a greater reduction in the activity of the amygdala in a moral-emotional decision-making task was found as the level of psychopathy exhibited by the subjects increased (Glenn, Raine, & Schug, 2009). In addition, the reduced amygdala activity in this study correlated with the four facets of psychopathy, and in terms of cortical regions the mPFC, PCC, and the angular gyrus showed less activity in psychopaths who obtained high scores on the interpersonal factor. It has also been proposed that psychopaths have an attenuated emotional response to fear and anxiety in particular (Lykken, 1957). This attenuated fear response explains the deficit in fear conditioning, in the physiological anticipation of unpleasant events and, therefore, in the lack of fear or anxiety related to unpleasant events such as witnessing a subject being brutally hurt. Studies examining the functionality of the amygdala during fear conditioning have arrived at contradictory results, some have found deficiencies (Birbaumer et al., 2005), while others have reported increased activity in the amygdala (Schultz, Balderston, Baskin-Sommers, Larson, & Helmstetter, 2016). We attribute such inconsistencies to methodological aspects. The responses of the amygdala to facial expressions of fear, anger, surprise, and neutral expression were also examined in a sample of non-imprisoned young adults (mean age 19.65±1.30 years), using a face-matching task (Carré, Hyde, Neumann, Viding, & Hariri, 2013). The authors observed low activity in the amygdala in response to fear and high reactivity to anger. The low reactivity to fear was associated with the interpersonal facet, that is, with what can be described as the discomfort of the person showing the expression; such low activity to signs of fear has been suggested to be the basis of instrumental aggression. In turn, the high reactivity to expressions of anger was associated with the facet of life style, and would be the basis of reactive aggression. In contrast, a study by Decety, Skelly, Yoder, and Kiehl (2014) found no differences in the amygdala between psychopaths and non-psychopaths in response to facial expressions displayed using video clips. From a legal perspective, it is a very difficult issue. If it were proven that punishment works worse with psychopaths (in other words, that here the punishment does not deter as much as it should) the legitimation of their punishment would be scarcer in some punishment's theories (for example in the “theory of deterrence”). The only sources of legitimacy would be, in that cases, the social ones. And it supposes a serious legitimacy problem. Nevertheless, it does not happen with all criminal theories (there is, then, here another important theoretical and legal question). In terms of the prefrontal cortex in normal nonclinical subjects, the control of aggressive impulses translates into greater activity in the ofPFC (Pietrini, Guazzelli, Basso, Jaffe, & Grafman, 2000). Also, the activity of the ofPFC increases when facial expressions of anger growing in intensity are observed (Blair, Morris, Frith, Perrett, & Dolan, 1999). One of the first functional studies of the prefrontal cortex of psychopathic subjects was performed by Raine et al. (1998), using positron emission tomography. The murderers they called predators (corresponding to psychopaths) had an activity of the prefrontal cortex (the authors did not distinguish among regions) similar to that of control subjects, but they showed greater subcortical activity. Yang and Raine (2009) conducted a meta-analysis to try to integrate cortical functional findings in psychopathic, antisocial, and violent individuals. The regions that showed a reduction in functional activity were the right ofPFC, the right ACC, and the left dlPFC. Several studies have found a reduced activation of the vmPFC and the ofPFC when psychopaths observe emotional facial expressions in people being hurt (Decety et al., 2014; Marsh et al., 2013). Research has also been conducted to examine the empathic interest and moral sensitivity of psychopaths, and which brain regions are related to these behaviours (Decety, Chen, Harenski, & Kiehl, 2015; Decety & Moriguchi, 2007). These studies have demonstrated from a behavioural point of view that psychopaths are able to distinguish between right and wrong actions, in addition to interpret the emotional consequences of such actions on other people. Interestingly, it has been found using fMRI that when they are asked to pay attention to a perpetrator doing something wrong, there is decreased activity in areas that are related to empathy and perspective taking (amygdala, insula, nucleus accumbens, and several regions from the PFC such as the dlPFC, vlPFC, mPFC). However, psychopaths exhibited increased activation in these same network areas when they had to infer the emotional state of a victim of a harmful action. Nonetheless, these studies are still very recent and there are contradictory results, even among studies carried out by the same research group. Psychopathy is a multidimensional personality disorder diagnosed primarily in the context of criminal justice. Here, there is heated debate on whether psychopathy can influence the criminal responsibility of those who have the disorder (and if so, to what extent). However, psychopathy does not only have an impact only on issues pertaining criminal law, because its presence may have implications relevant to many other institutions closely linked to the way sentences are executed. The resolution of these issues must take into account all recent scientific advances. However, it is not expected that scientific developments become the only ones dictating the way psychopathic subjects should be legally treated. How to legally treat psychopaths and what to do with them is a matter that should be socially determined, given that “making a decision” depends not only on the natural or scientific status of psychopathy, but also on social will, based on ethical, normative, and valuation issues. Therefore, the answer to the responsibility of the psychopath cannot be directly resolved by any scientific discovery. Science provides “raw data” that must pass through processes of social decisions (criminal justice, in this case) for them to be properly configured. This, however, does not imply that we should opt for “blind normativism”, disengaged from the reality to which it refers. As we have seen, there are some points that suppose complications in different theories of crime (for example, deficits in inhibition, low reactivity to fear and to a lesser degree, lack of remorse). That does not mean, however, that criminal law has no appropriate response. It just implies that some of its theories does not work, and they must be reviewed in the light of new progress in behavioral sciences. It is necessary, as we have noted before, that Science and Law interact and collaborate with each other (at the ontological and normative levels) in such a complex issue as is psychopathy. As for the scientific matter, we must emphasize that it is not possible to draw generalizations about neurological injuries and their behavioural correlates when searching for similarities with psychopathic behaviours, but it is true that damage to the ofPFC and vmPFC (Figure 1) is the one that leads to the behavioural changes (reversal learning, game tasks, and physiological responses to emotional stimuli) most similar to those exhibited by psychopaths (Koenigs & Newman, 2013). A. Medial sagittal view of the right hemisphere. Note. The frontal area is on the left and the occipital area on the right; in black, the corpus callosum. Note. The lines correspond to the boundaries of the areas. In dotted lines are the BA 11, 12, and 25, considered part of the vmPFC. C. Lateral view of the left hemisphere. Note. The frontal area is on the left and occipital area on the right. BA 46 is the dorsolateral prefrontal cortex (dlPFC). D. Basal View of the frontal lobe of the right hemisphere, in which part of the vmPFC is shown in dotted lines. Note. The rest of the base of the frontal lobe is formed by the orbital gyri. OLF, olfactory sulcus; MOS, medial orbital sulcus; TOS, transverse orbital sulcus; LOS, lateral orbital sulcus. A, B and D published with permission from the editor. Original source: Ortega-Escobar J. and Alcazar-Córcoles M. A. Neurobiology of aggression and violence. Yearbook of Legal Psychology 26 (2016) 60-69. Copyright © 2016 College of Psychologists of Madrid. Published by Elsevier Spain, S.L.U. This is an Open Access article under the CC BY-NC-ND license”. C taken and modified from Brodmann (1914). However, subjects with damage to these areas may not show violent or criminal behaviour to the same extent as psychopaths, except for those who have suffered such damage during early childhood. Such damage has no effect on intelligence or memory as measured with standard neuropsychological tests. The damage in adult subjects leads to several disturbances, including problems in decision-making, materialized in behavioural perseverance even when inappropriate in regards to the surrounding stimuli or dysfunctional in terms of its value; likewise, they present emotional deficits in response to auditory and visual stimuli. For some authors, behavioural perseverance, even if the chosen option is no longer correct, is regarded as a deficit in the inhibition that should exert the vmPFC and ofPFC; this hypothesis was deduced from the behaviour of patients such as Phineas Gage or animals with lesions in these areas. For others authors, however, the role of these areas -mainly the ofPFC- is rather to predict and assess behavioural outcomes after making a given decision that can involve an emotional nuance because of the information coming from the amygdala. In none of the studies of patients with damage during adulthood it has been observed the type of instrumental aggression described in psychopaths. Perhaps the prefrontal region that leads to greater emotional changes in studies of brain lesions is the ofPFC and its connections with the vmPFC. This is probably because of the connections of these two areas with the amygdala, which brings an emotional aspect to the complex sensory information coming to the amygdala from the association sensory cortical areas. Therefore, a lesion in the ofPFC and vmPFC leads to emotional dysfunctions and, because of the lack of connection with the prefrontal cortex involved in cognition, the dlPFC, to a disconnection between cognition and emotion, which could explain the uninhibited nature of psychopaths (Alcázar-Córcoles, Verdejo-García, & Bouso-Saiz, 2008; Alcázar-Córcoles, Verdejo-García, Bouso-Saiz, & Bezos-Saldaña, 2010). One aspect worth noting is that the earlier the damage occurs in the ofPFC and vmPFC the greater the resemblance with the behaviour of psychopaths: superficial emotions, lack of empathy and remorse, manipulative with family members and classmates. Besides it, they are unable of learning stimulus-reinforcement, which may interfere with the learning of social rules and lead psychopaths to resort to anti-social behaviour in their relationships, including planned instrumental aggression. Patients with damage to the amygdala present deficits similar to those of psychopaths, as occurs with aversive conditioning, recognition of facial expressions of fear, and stimulus-reinforcement learning. These patients often show deficits when processing social information, such as the reliability of a person, something that does not occur in psychopaths. The problems caused by the damage to the amygdala could therefore prevent the affected individuals from distinguishing the right behaviours and lead them to resort to inappropriate or antisocial behaviours. Research using structural and functional nuclear magnetic resonance imaging have revealed the role of the structures discussed above as well as that of other cortical regions depending on the type of task employed by the researchers (decision-making, moral processing, facial expressions, and emotional empathy). At present, we can affirm that these studies, mostly the functional ones, seem to reveal a reduced activity in areas associated with emotional processing and increased activity in regions associated with cognitive control. Finally, even though the basic brain regions examined here – ofPFC, vmPFC, and amygdala – appear as isolated structures, they actually form part of densely interconnected circuits: thus, a great amount of information from the visual, auditory, somatosensory, and olfactory association areas is sent to both the amygdala (Gattas, Galkin, Desimone, & Ungerleider, 2014; Stefanacci & Amaral, 2002; Tsvetkov, Krasnoshchekova, Vesselkin, & Kharazova, 2015) and the posterior ofPFC (Barbas, 2000; Cavada, Compañy, Tejedor, Cruz-Rizzolo, & Reinoso-Suárez, 2000); both the amygdala and the ofPFC are also strongly interconnected among them (Aggleton, Wright, Rosene, & Saunders, 2015; Timbie & Barbas, 2014); the ofPFC connects with the vmPFC, which in turn connects to structures involved in autonomic and visceral control, such as the hypothalamus and brainstem centers; finally, the posterior ofPFC connects with the anterior ofPFC, which in turn connects with the dlPFC, more associated with cognitive aspects (Barbas, 2007). It is important, in terms of what is discussed in this article, to take into account that the ofPFC “encompasses a broad representation or model of an individual's sensory milieu and potential actions, along with their relationship to likely behavioural outcomes” (Rudebeck & Murray, 2014, p. 1143), and therefore, an injury in the ofPFC would result in the disappearance of such sensory representation, primarily emotional and, unaware of the outcome of his or her actions, the individual would not choose the most appropriate or adaptive action within the immediate social context. This study was conducted as part of the research project “Antisocial personality disorder, psychopathy, and criminal reiteration [Trastorno antisocial de la personalidad, psicopatía y reiteración delictiva]” (CEMU-2013.23), from the Autónoma University of Madrid. 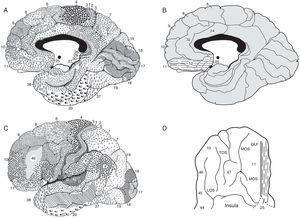 BA: Brodmann areas; ACC: anterior cingulate cortex (BA 32, 33, 24 and 25) (Fig. 1A); preACC: pregenual anterior cingulate cortex (BA 32, 33 and 24) (Fig. 1A); subACC: subgenual anterior cingulate cortex (BA 24, 32, 33 and 35) (Fig. 1A); PCC: posterior cingulate cortex (BA 23, 29, 30, 31) (Fig. 1A); PFC: prefrontal cortex; dlPFC: dorsolateral prefrontal cortex (BA 46) (Fig. 1C); ofPFC: orbitofrontal prefrontal cortex (BA 11 and 47) (Fig. 1C); vmPFC: ventromedial prefrontal cortex (BA 12) (Figs. 1B, D); mPFC: medial prefrontal cortex (BA 32 and 12) (Fig. 1B). Cancio Meliá, M. (2013). Psicopatía y Derecho Penal: Algunas consideraciones introductorias. In J. G. Fernández Teruelo, M. M. González Tascón, & S. V. Villa Sieiro (Coord. ), Estudios Penales en Homenaje al Profesor Rodrigo Fabio Suárez Montes, (pp. 111-126). Oviedo: Constitutio Criminalis Carolina. Derecho Penal y Neurociencias. ¿Una relación tormentosa? Peñaranda Ramos, E. (2015). La pena: nociones generales. In J. A. Lascuraín Sánchez (Coord. ), Introducción al Derecho Penal (2ª edición, pp. 221-260). Pamplona: Civitas. La custodia de seguridad. ¿Retorno al pasado o regreso al futuro?